Although Shopify Unite unofficially kicked off with Day Zero on Monday, May 7th with Shopify Plus Partner Day and local partners’ opening their doors for panels, interactive question and answer periods, and tours of their offices, Shopify Unite officially kicked off for their third annual conference on Tuesday, May 8th. For the first time since Unite’s inception three years ago, Shopify came home to their Canadian roots, choosing to host this year’s partner and developer conference at the Evergreen Brick Works in beautiful Toronto, Ontario, Canada. And What a Shopify Unite the 2018 Show Was! For Partners and Developers lucky enough to grab tickets to this year’s conference (and those who were able to catch a livestream of the main stage, live-streamed around the world), there was an incredible number of announcements, that were enthusiastically received by all in attendance. The buzz around Shopify and Shopify Plus is incredible and indisputable, and you don’t need to look any further than Shopify themselves and the incredible community of passionate agencies, technologists, developers, and merchants who do not simply subscribe to the platform and what it offers, but also to the belief that Shopify empowers entrepreneurs. Start here: This comprehensive summary from Shopify Plus’ blog covers everything announced at Shopify Unite, including how announcements will simplify, automate, and accelerate Merchants’ global growth. If you’re a Shopify Partner, like VL OMNI is at the Shopify Plus level, then check out this article on the three ways Shopify is helping Partners build better businesses in 2018. Shopify is taking international ecommerce growth seriously, and has listened to partner feedback: not only is multi-currency for Shopify Payments coming soon, but so is mutli-language support. A new, better Shopify Apps and Partners Marketplace is on its way, and Shopify finally introducing a Services Marketplace! Connectors for Shopify Flow are poised to simplify how Merchants work with their Shopify Apps and Partners while helping Partners like VL OMNI extend their offerings and build faster. We’re really excited about this one! New hardware announcements bridge online and offline and reiterate Shopify’s focus on helping Merchants create and nurture a truly multi-channel retail ecosystem, including AR/VR and Shopify’s redesigned Tap & Chip Reader. The Shopify Admin API & GraphQL: Shopify was so impressed with the impact of GraphQL’s efficiencies last year, that they started to use it in their own platform development. Now Shopify is extending GraphQL into their most-used REST API — the Admin API. This enables declarative data fetching where you can specify exactly the data you need from an API. VL OMNI is also really excited about this announcement! Solving for the complexities and operational challenges Shopify Merchants currently face when managing inventory across multiple locations, Shopify announced their new Inventory API that allows customers to retrieve, set, and update store inventory across multiple locations. While the announcements were what hundreds of Shopify and Shopify Plus Partners and Developers came to Unite for, the event itself had tons of peripheral action that made it into three non-stop days of ecommerce and multi-channel excellence. On Day One, the Right Honourable Justin Trudeau, Prime Minster of Canada made an appearance at Unite (to the absolute delight of many international visitors!). 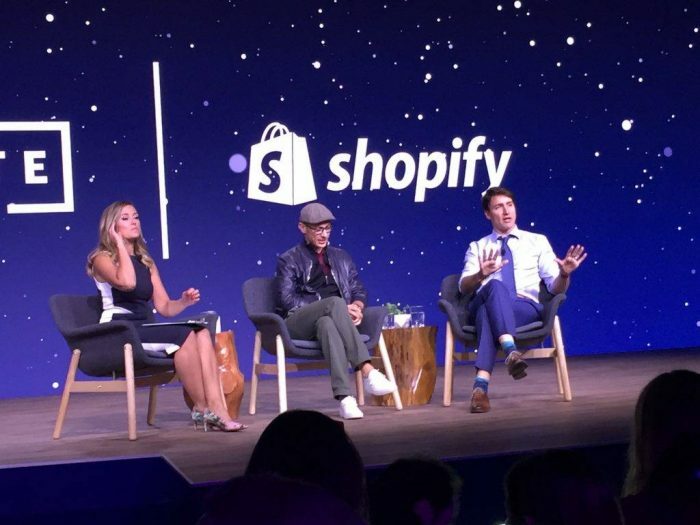 Mr. Trudeau sat down with Shopify CEO and Founder Tobi Luke and Amber Mac to have an open discussion on Canadian entrepreneurship, diversity in the tech sector, and supporting Canadian talent and innovation. Many in the audience found this final keynote absolutely inspiring! Day One wrapped with a fantastic after party at the Rec Room in downtown Toronto. Arcade Games, photo booths, DJs, and surprise guest DRAM had everyone up and dancing the night away. Day Two at Unite 2018 took a deeper dive at the announcements made on Day One with breakout streams and panels with lots of opportunities to ask questions and network. For VL OMNI, it was a rare chance to have many of our increasingly international partners in the same place at the same time! By the end of Day Two, the feeling was unanimous for all Unite attendees: Shopify and their Partners are going to have a very exciting year! Check out our visual recap of all the exciting and fun highlights! Are you a Shopify Plus Merchant?